You will be given a reference e-book to read which has 1050 pages And the test will be based on that e-book , you can take final test within 1 year of purchase. Cooking refers to a food preparation process which uses heat. It works by preparing food through the application of heat and properly selecting, combining and measuring ingredients. The most common cooking ingredients and techniques that are used at present vary from one country or culture to another. This means that the ingredients and techniques used in cooking primarily reflect cultural, economic and environmental traditions. It should be noted that there are also instances when the cooking process is executed without the presence of heat. This takes place when chemical reactions are used when preparing foods. This technique is mainly used in preparing a popular and traditional South American dish called Ceviche. This dish is prepared by cooking fish using the acids in either lime or lemon juice. The cooking process usually uses ingredients that are taken from living organisms. These include grains, nuts, fruits, vegetables, herbs, spices, eggs, meat and dairy products. There are also recipes that require the use of spirits or wine to improve their taste. Other ingredients used in the cooking process are those that contain carbohydrates including common sugar, disaccharide, sucrose or table sugar, simple sugar, fructose, cereal flour, potato, arrowroot and rice. Most cooks also use ingredients that contain fats, vitamins and minerals and protein. If you want to become an expert in cooking, then you have to familiarize yourself about the most common cooking techniques used including smoking, braising, steaming, boiling, barbecuing, grilling, frying, baking and roasting. 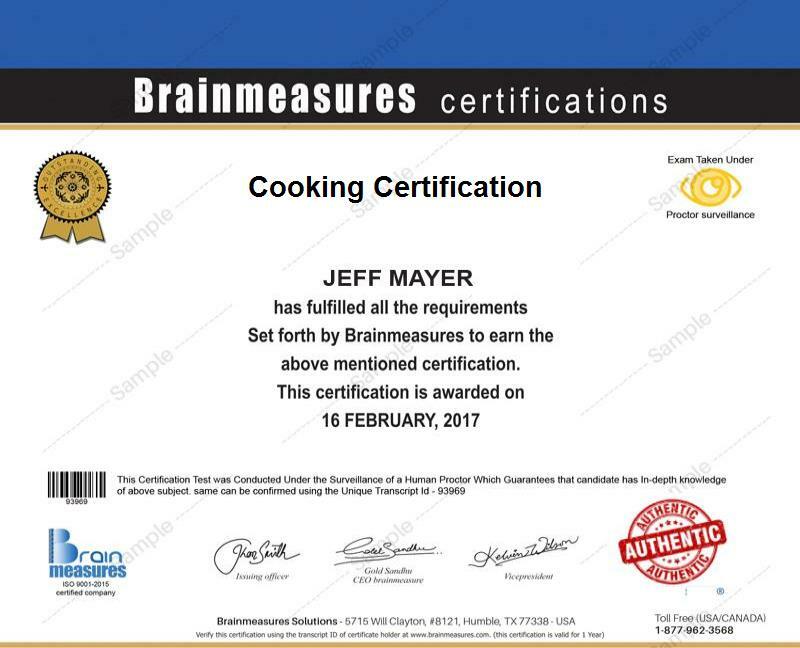 If you want to become a cooking expert, then be aware that Brainmeasures which is a highly reputable online certification company recognized worldwide now includes a cooking certification program among its many offers. Enrolling in this cooking course is highly beneficial because it allows you to learn everything about cooking considering its comprehensiveness. This online certification course allows you to undergo a cooking training which explains in full detail everything about the process including the basic cooking principles, the most common cooking techniques that are now used at present, the healthiest and delicious ingredients that you can use and the many tools and equipment that you should use in cooking. This certification course also allows you to gain a more complete understanding about all the food safety rules and regulations that you need to strictly follow. As soon as you receive your cooking certificate, you can start showing the entire cooking industry that you have what it takes to become an expert cook. Everyone who loves to cook can definitely gain benefits from enrolling in the cooking certification course offered by Brainmeasures. It targets all aspiring and existing cooks, chefs, pastry experts, bakers, food and sanitation experts, hotel and restaurant managers and any other individuals who want to master all the principles and methods associated to cooking and ensure that they continuously prepare the healthiest, safest and the most delicious recipes / dishes. The jobs that will become available for you as soon as you complete your cooking certification is capable of offering you a higher level of salary so you will never regret your decision to enroll in it. If you work as a chef in the catering and retail industry, then you can expect your annual salary to be within the range of $35,000 to $85,000 per year. The good thing about being a chef is that you can also get positions in hotels and restaurants and this will allow you to earn over $100,000 annually.